Former chairman of the Minjoo Party Moon Jae-in at a rally in Gwangju on April 8, 2016. SEOUL, (Yonhap) — Early voting for next week’s parliamentary elections kicked off Friday for a two-day run, with scores of candidates casting their ballots in a bid to raise turnout amid lingering uncertainties about voter sentiment. The voting carries extra weight as a recent survey showed that more than a quarter of the electorate has yet to choose a candidate for the April 13 polls to elect 300 lawmakers for a four-year term. Advance voting began at 3,511 polling stations across the nation at 6 a.m. Friday. The National Election Commission (NEC), the national election watchdog, said the turnout for the first day was 5.45 percent, with about 2.29 million people having cast their ballots. By region, South Jeolla Province recorded the highest rate at 9.32 percent, while the southern port city of Busan recorded the lowest at 4.47 percent, according to the NEC. Polls were open from 6 a.m. to 6 p.m. on Friday, and will operate in the same 12-hour period on Saturday. Total voter turnout is expected to depend largely on two factors — turnout during the early voting period and public interest in the elections. Election officials have voiced hopes that the turnout will be higher this year compared to the previous local and by-elections. As part of efforts to boost voter turnout, lawmakers of both the ruling and opposition parties visited polling stations nationwide and cast their ballots. Won Yoo-cheol, floor leader of the ruling Saenuri Party, visited a polling station in his electorate of Pyongtaek, 70 kilometers south of Seoul. A number of the party’s proportional candidates also visited a polling station in Yeouido, western Seoul, to draw more voters to the polls. Chairman Kim Moo-sung, meanwhile, is scheduled to vote on election day in his electorate in the southern port city of Busan. Several former Saenuri lawmakers, including Yoo Seong-min, participated in early voting as well, with Yoo voting in his electorate in Daegu. Yoo, a former floor leader, defected from Saenuri and is running as an independent candidate after failing to get a party ticket. Seol Hyun of the girl group AOA, an honorary ambassador for the April 13 elections, speaks to reporters after casting her ballot in early voting on April 8, 2016. Leaders and lawmakers of the main opposition Minjoo Party of Korea also visited polling stations across the country to encourage voters to participate in the election. “Please participate in early voting today and tomorrow after making up your minds to determine which candidate will improve your livelihoods,” Kim Chong-in, the party’s interim chairman, told reporters after casting his ballot in the western port city of Incheon. Meanwhile Moon Jae-in, former chairman of the Minjoo Party, said he will retire from politics and not participate in next year’s presidential elections if the party losses support from its home turf. 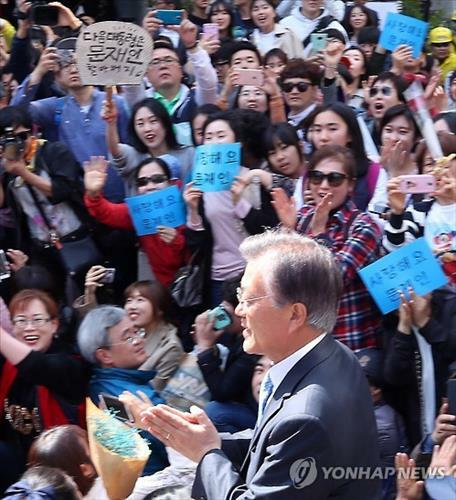 “I will gladly accept the decision of Honam,” Moon said at a street rally during his visit to the southern city of Gwangju. Honam refers to the southwestern region that has traditionally been a bastion of support for liberal parties like Minjoo. Moon’s remarks come as a recent survey showed that the party is struggling to win over voters in the region as it faces stiff challenges from the splinter People’s Party. Popular K-pop stars such as Seol Hyun of the girl group AOA and Oh Ha-young of the girl group A-pink, meanwhile, also visited polling stations and cast their ballots. Seol, who was named an honorary ambassador for the April 13 elections, visited a polling station in southern Seoul. The early voting system, first adopted during the 2013 by-elections, is different from absentee voting in that it does not require voters to sign up in advance. Eligible voters who may be busy or away on election day, which falls on Wednesday, can simply show up at a polling station during the early voting period and cast their ballots. The ballots will be kept by the country’s election watchdog until vote counting officially begins after the April 13 polls. On Friday, police vowed to intensively crack down on illegal electioneering as the critical elections near. “Cases related to elections, which involve conflicting interests, require a prompt reaction,” said Kang Sin-myeong, commissioner general of the National Police Agency, during a video conference held among high-ranking police officials.